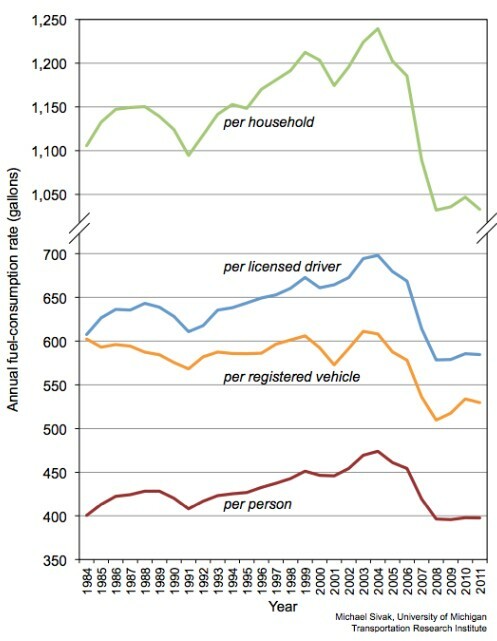 I wrote late last year how Americans appear to be losing their luster for cars, driving less, obtaining fewer licenses, and using less gasoline. 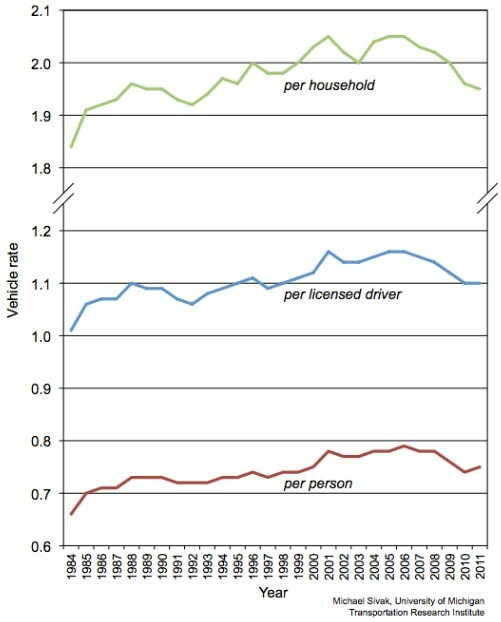 The below charts from The Atlantic illustrate the situation nicely, suggesting that the US might have hit “peak cars”. As fuel costs rise and technology improves (enabling working from home and reducing the need for commuting), one would expect these trends to continue. Of course, this should lead to a lowering of Toll prices, much like has happened in Australia’s electricity pricing. Right? Ballooning levels of student debt could also be part of the reason US under 35s are buying fewer new cars. yep – bikes are cheap fun, don’t ruin the environment or cover you in the slime of bank debt. Cars are like ciggies – All that’s left is just old marketing for cool. In reality they are a prosaic piece of steel and plastic over a combustion engine. 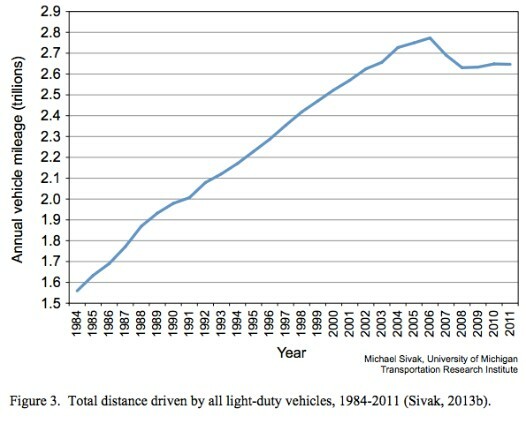 Car use has dropped by millions of miles per year…..!!!! Overall travel has dropped. There is a recession on, or at least greatly constrained discretionary income and increased debt, especially among the young, who are also disproportionately unemployed. Public transport mode share has risen from 4 percent to 5 percent. Cycling mode share has risen from 0.5% to 0.6%. Car mode share has fallen from 90% to 89%. Hold the front page…… cars are SOOOO yesterday, people are flocking to bicycles and public transport…….!!!!!! Phil – cars are useful, just not cool. And in cities for commute time cars are not even useful. Being covered in car loan slime just to sit in mind-numbing traffic is super tragic. I don’t know where to start with that Luddite comment. Without cars, we would not have first world economies. It is as simple as that. The USSR tried forcing everyone to live in apartments and catch trains, and it was a disaster of lost productivity. The longest average commute-to-work times in the OECD major economies are in the UK; which happens to have the highest urban density and the least urban road lane-miles per capita, along with decades of public-transport oriented planning. The UK also has a large productivity gap compared to other nations, and if it was not for the historical accidents that made London the world’s main global finance power-house, the UK economy would be even more “toast” than what it is. Ha. I love riding past the parked cars in the traffic on the way to work. Cars are useful in the regions pointless for the city commute. You love cars because you see them as enablers of land use – fair enough. But i could ride to work from 20km out of Melbourne far quicker than drive – had a car park and rarely used it. Your point on saturation is more correct, cars are so cheap and ubiquitous in the city they have become relatively useless during busy periods. Car marketing is now just a load of crap marketing – have a look next time and see if you can see another car in the car ads? Just like reality hey. Young people get it – you don’t. And the UK is, as you point out, a stupid example of shoving people into one spot, so hardly a good example. In many ways the car has been the historical enabler of mobility so well, that it has become the tool to force workers into a spot that suits the rich management classes not the poor that live a long way from city centres. As the traffic gets worse and worse, the car becomes more a tool of enslavement than freedom. If i were a car industry CEO i would be looking into how to position the company to take advantage of the coming boom in electric “micro-cars”. The developing world has an unmet demand for energy efficient super low cost personal transport (think 2000 to 4000 dollars per car). As I’ve said before, the car industry will become a low margin commodity industry in the next few decades, much like personal computers. Australia is in a unique position to benefit from electric runabouts. Many trips could be done with just the energy from solar collectors on the car. The Solar challenge demonstrates the viability. This car averaged 75kph and has a top speed with full load that exceeds posted limits in all states bar NT. 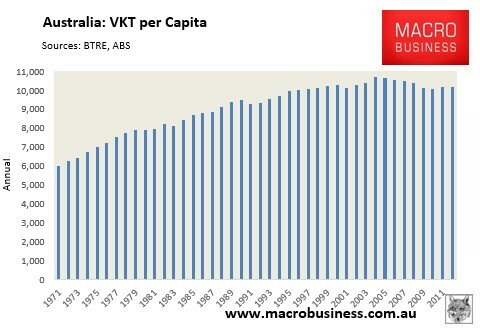 One factor working against this development is that Australia does not have its own car industry. The cars currently built here are dominated by the perceived needs of the US car industry. Eventually all cars will be electric powered of some sort but Australia has a natural advantage for the development of solar electric vehicles. Agreed . Solar powered runabout with creature comforts for urban use. I want one but…. how much$$$?? That is a seriously ugly vehicle. Babies probably start crying when it drives past. That way the vehicles don’t have to make all the practical (and significant) compromises necessary to run from such a low-density power source. Actually solar panels on the vehicle make a lot of sense for Australian conditions – see more comments regarding the BMW i3 below. The shape appeals to me for its aerodynamics and large surface area. In any case a vehicle with infinite range and no fuel costs would appeal to me irrespective of its looks. Kei cars like the Cappuccino would be great – if they weren’t begging for a SUV to drive right over them. I do not regard this as cheap and it does not make use of solar. To my knowledge none of the existing manufactures are looking at solar collection on the vehicles. Actual solar cells are very light – about 3.5kg/kW. On an average day in southern Australia a 1kW panel will produce 4kWh – more in higher latitudes. A battery able to store this amount weighs 50kg. Hence it makes sense for Australian vehicles to include solar collection as well as batteries. The rooftop car parks at the shopping centres would be the most crowded. Having energy collection built into a vehicle affords infinite range. However the exposed panel area is more of an issue for cars because this limits the rate of collection and consequently the average speed. Fitting all exposed panels with solar cells would give at most 2kW of collection with current technology. With low wind and rolling resistance combined with regenerative braking this is significant as the solar challenge cars demonstrate. It is counter to all notions of systemic efficiency, to think that urban transport will reduce in flexibility. There is some very interesting “Kondratieff curve analysis” by systems analysts like Marchetti and Nacenovic. Waterways peaked in about 1840. Rails peaked in about 1950. Cars are peaking about now. Each advance was to a more flexible system. Look at the options that are in development right now. It is something with more flexibility than the existing car, not less, that is the next big wave of the future. But Luddites constantly preach “great leaps backwards”. What might be more flexible and cheaper for most PB? – i’m ‘two tyred’ to think about it but. 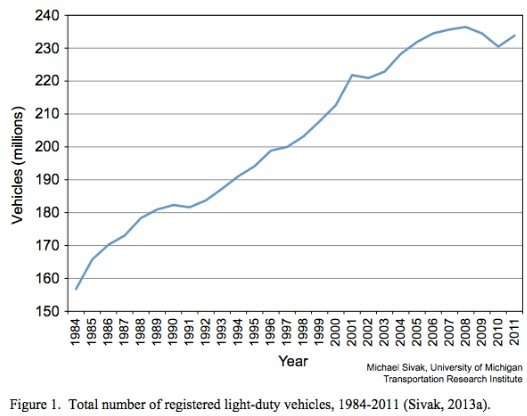 The need for cars IS dying. My commute for the last 12 years has been two steps up from the kitchen and then five paces to my office. Most of my purchases are made on the internet. I shop around through product review sites and have established a good selection of reliable internet shops. I now have a diesel engined car that will go a couple of months on a tank of fuel – it was selected through an online car site. I am usually in a position to plan fuel purchases based on the best Coles or Woolworths discounts – something that is now being phased out. 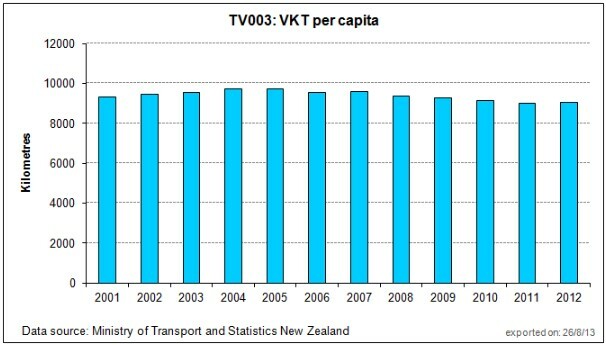 When I consider what China has done to flat panel TVs and solar panels there are good prospects for low cost transport. On the other hand the price of cars has been static for 15 years despite inflation while the performance and features have steadily increased. To my knowledge BMW is leading the field in mass producing carbon fibre panels that give the weight reduction while retaining the strength needed to help the viability of battery cars. It’s interesting to look at the weight of old and new cars. AJ, the potential utilisation rates of shared driverless cars could be a massive economic game-changer. Joneses, I couldn’t agree more. This is one of the reasons that super-low-energy-requirement “cars” are going to be such a success: globalisation. It won’t be left to BMW and Tesla; the Chinese will be pumping them out like cordless drills, at similarly competitive prices compared to what the pioneer, high-end makers could do. Based on the quality of my cheap Chinese power tools, I’m not sure I’d want to be in one of those cheap Chinese cars if it hit something. 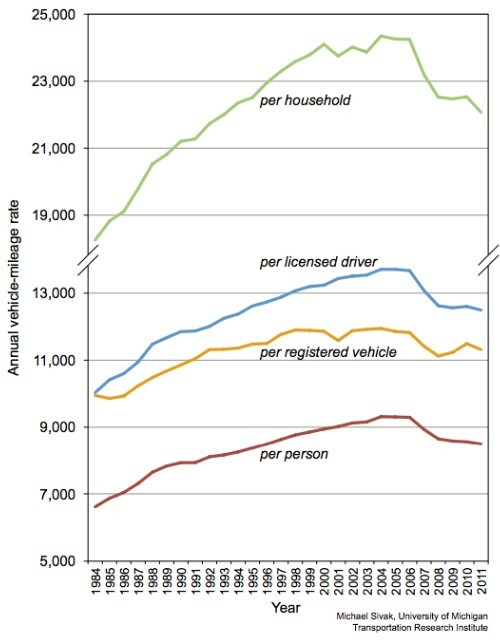 Should add that I think there is likely some substance to the idea of peak car use. I mean it’s not like we can keep driving ever more km each year, nor would most of us want to. There has to be some sort of upper limit. “We” don’t keep driving further and further every year if we can help it. This is most usually an unintended consequence of urban planning that forces up the price of all housing options at all locations, and forces first home buyers into the least efficient locations. Notice how it is all the unaffordable-housing cities with the longest average commutes? And there is no evidence that higher densities reduce commute times. In fact the evidence looks to run the other way. No other city as small as Stockholm has such outlier-bad average commute times, and US cities of comparable population and 1/4 the density have average commutes times close to 1/2 Stockholm’s. The following all make matters worse rather than better: planned centralisation, to make mass public transport less inefficient; “compact city” planning that drives the price of urban land up and makes most co-location possibilities unaffordable to most people; and deliberate neglect of road spending, particularly on inter-suburban connectors and for new edge cities. In a contest of massive scale and low input costs why on earth should we be giving scarce public funds to foreign-owned high-cost small-scale locally-based car manufacturers to compete head-on with this? Since 2000 petrol prices have doubled which has resulted in an across the board drop in energy consumption. It’s also lead directly to Holden and Ford closing factories in Australia! As for the younger generation… draconian licensing and insurance requirements combined with high youth unemployment in some regions has priced kids off the road. Once EVs go mass market with a cost of $0.03 per km…. peak car will be over…. and Arabia can keep their peak oil. I’d suggest you change the title, the world of cars is a little bigger than just the US. Japanese and German production is growing largely in support of an Asian export market. Truth is in the ares of cars the US is just not important anymore! Given the hollowing out of the US middle class, the class which bought most cars in that country, why should car makers be surprised? Furthermore, since they are in the van of the movement cutting wages and conditions of their work force, they are only reaping the rewards of their own policies. Of course people are going to purchase fewer cars and travel fewer miles if they have less income. Expecting anything else would be silly. Exactly – see my comment below. Leith, it’s not “peak car”, it’s “saturation”. Once you’ve reached saturation, there will be ups and downs as economic conditions vary. “…..if they (Litman’s numerous other factors) truly made a difference, then it would not be possible to estimate the driving habits of Americans with a simple formula using only two variables. I have no problem with your analyzing all of those other variables. My point is that my analysis clearly shows that you DON’T need to consider a single one of those factors to make an estimate of American driving habits. You can make a very, very accurate estimate by just considering the fuel price and the American per capita GDP. PB – you see cars as enablers of freedom. Perhaps because of your history and your age and the role they played in the modernisation your saw. But to many of the younger generation, they are the opposite, these are the steel boxes spewing exhaust that the family or the breadwinners were locked in for long hours of the day sitting in mute conformity to the untamed monster of industrialisation. Cars are the answer to some things and the problem for many others. I’d suspect the younger generation has a more nuanced perspective on the utility of the car and role it plays in passive industrial conformity. This organisation uses GPS based data and is usually quicker to indicate trends than the official agencies. I would pick from this latest release, that “peak car” is over in the US. I still hold that “saturation” is close. That is different to “peak”. Another cause, is the ridiculous complexity and cost of getting a license, that has come about in the last decades. It is another example of the older generations stealing from the younger by forcing a costly lengthy process for getting a driving license. While the older generation got licenses in a much cheaper less complex process.